Seriously? OMG! WTF?Jonas Brothers Archives - Seriously? OMG! WTF? In honor of Game of Thrones returning for its final season yesterday, Joe Jonas shared a video of himself dressed as his fiancee’s character Sansa Stark on the show. No word how Sophie Turner felt about it, but how could she not love it. He looks so fierce. You know he would make a great female impersonator. Don’t you agree? I lived in Miami shortly after the ’80s, and it looked nothing like this sh!tty video that the Jonas Brothers did for their song Cool. I am so upset by how awful it is, that I wish they stayed broken up. Where are Crocket and Tubbs to arrest these guys and lock them up for life because this is a crime. When it comes to the song itself, it sounds like someone is squeezing Nick Jonas’ testicles and did not let go until he was done singing. Can’t Joe Jonas poop in private? Now that the Jonas Brothers are back together, that means that Kevin, Joe and Nick Jonas do everything together. And I do mean everything. 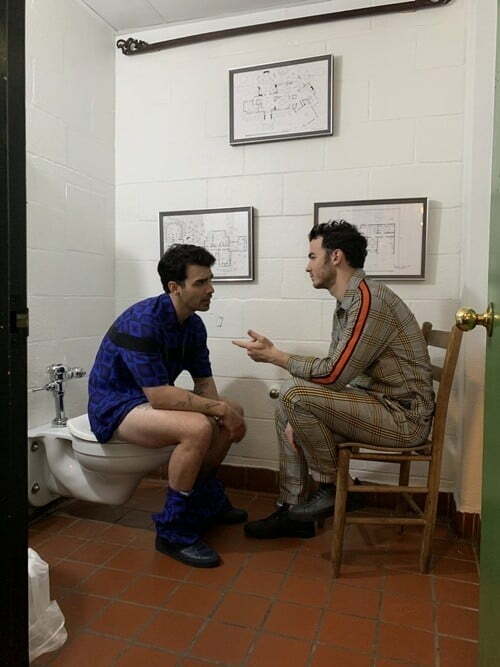 The other day after a performance, Joe wanted to take a poo but Kevin insisted on having one of their post show chats. Which is probably symbolism for how it went. I wonder who took the photo? I am assuming it is Nick, but it could have been his wife Priyanka Chopra. 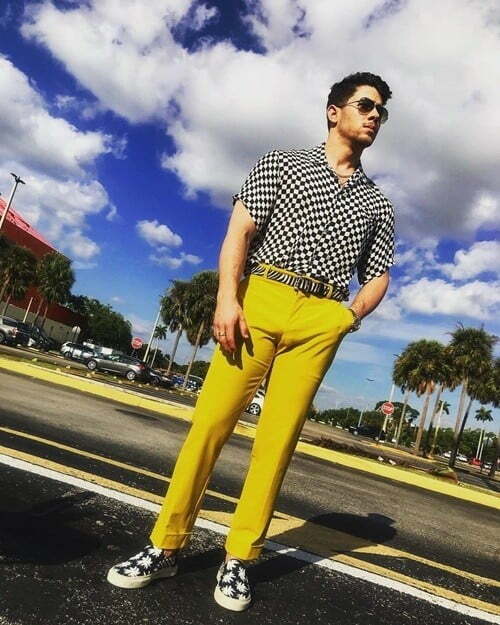 Hey Nick Jonas, is that a banana in your yellow pants pocket? Nick Jonas does not shy away from wearing very tight pants. Perhaps too tight. Because in these banana yellow pants you can see the outline of his hand and something to the right of his fingers. Which makes you wonder what else he has in his pocket or is he just happy to see us? Nick Jonas was photographed wearing a t-shirt with John Stamos’ face on it. The actor was so in enamored with that admiration, he made a pillow case of that image and had sweet dreams on it. When the singer saw that, he made a blanket of that image and let that picture warm his cold nights. How could Uncle Jesse top that? He got a tattoo of the youngest member of the Jonas Brothers on his arm. How is Mr. Pryianka Chopra going to top that? Only time will tell and you know they will tell us.